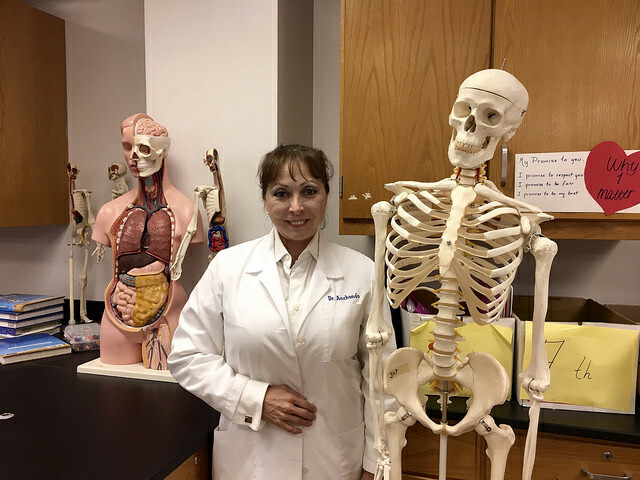 For the past 13 years, Dr. Elia Anchondo, has been putting her white lab coat on to teach high schoolers about the human anatomy and physiology in El Paso, Texas. But by trade she is a doctor, trained in Juarez, Mexico and forced to flee 24 years ago because her father-in-law was murdered and her family was threatened. Now she lives in a city that is the epicenter of the deportation crisis in America. “I feel bad for the people who are being deported because they are illegal looking for a better way to live,” said Anchondo. While on her midmorning break at Montwood High School, Anchondo, 57, remembered what brought her to El Paso and the life she left behind in Juarez. “They were really turbulent times, not just on the borderline, but in Mexico in total because the same political party was governing for many years,” she said. According to the New York Times, in 1985, Mexico saw the most political unrest they have seen in decades,. The Institutional Revolutionary Party (PRI) in Mexico was the dominant party from 1929 when it was founded until 2000 and the opposition, National Action Party, began challenging the PRI in the 1970’s. In order to win some elections, the PRI was accused of electoral fraud to solidify their position. Anchondo who was born in El Paso, a city of over 600,000 people with a population that is 81% Latino. She was raised and educated in Juarez for the convenience of her family. Once she got older and her mother retired, the majority of her family moved back to El Paso for more opportunities, but Anchondo stayed in Juarez. She attended medical school there with her high school sweetheart, Victor, who later became her husband. Together they pursued careers as doctors. Anchondo’s father-in-law, Dr. Victor Manuel Oropeza, a homeopathic doctor, was very involved in politics with the Popular Socialist Party. In the 1980’s he was one of the founders of the Mexican Workers Party and began writing for the local newspaper, “El Diario de Juarez”, about his opinions on politics in the country. Oropeza received a lot of death threats for speaking out against the government, but he never thought people would act on their threats, said Anchondo. But they did, on July 3, 1991, he was stabbed to death in his office. “He’s been part of the names of a lot of journalists that were murdered in Mexico, he was maybe the first, then after that there were several,” said Anchondo. According to a report by the International Federation of Journalists (IFJ), 2297 journalists have been murdered from 1990 to 2015 in countries around the world. Mexico was named one of the most dangerous countries for journalists. After a two-year investigation, the family never found out who killed Oropeza. Anchondo and her family feared for their lives. Dr. Elia Anchondo sitting at her desk in her classroom at Montwood High School in El Paso, Texas. 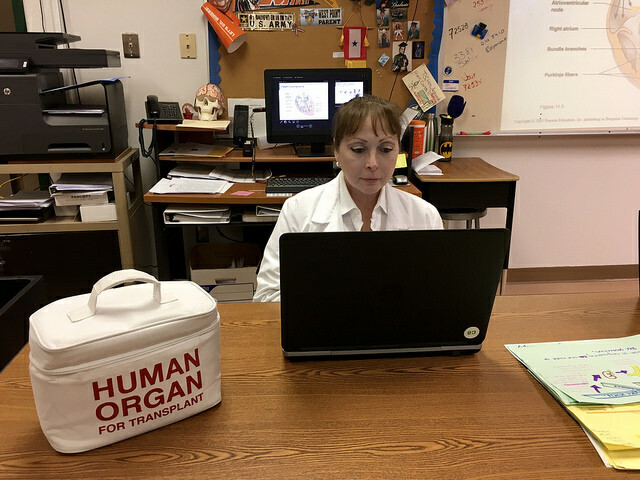 Her lunch bag, “Human Organ for Transplant” makes her students laugh. Photo by Jennifer Cohen. At the time Anchondo’s daughters were five and two months old, but since Anchondo was born in the United States her children became naturalized citizens. According to the U.S. Citizenship and Immigration Services fact sheet, in the U.S. over 680 thousand people are welcomed through naturalization with the majority of people born in Mexico and living in one of 10 states including Texas. For her children it was the best choice to move, but it put a strain on her husband as he struggled with the death of his father and the change of careers, she said. Anchondo’s husband never had citizenship in the U.S. He was a resident alien for 12 years before he was deported. In 2016, over 240 thousand illegal aliens were removed by the U.S. Immigration and Customs Enforcement. President Trump has put into place new immigration laws to aggressively target undocumented immigrants in the U.S. and build a wall along the border of Mexico. For Anchondo life is completely different in El Paso than it was in Juarez. Not being able to practice medicine as a doctor, she became a teacher. Now she will only cross the border to eat good food and does not want to move back to Mexico.